Children of the Hamakuya community. Community residents find employment at the small "green" resort of Tshulu Camp, bringing needed revenue into the village. My husband Ken consulting his bird guide on our tent's deck in Tshulu Camp. I've written a lot about supporting people in struggling nations who are trying to transition to sustainable livelihoods. One great example of local people choosing to conserve their own natural resources, and finding employment in doing so, is Tshulu Camp in northeastern South Africa. It's operated by the Tshulu Trust, also local. We had the good fortune to stay at Tshulu Camp, a small nature resort, this past June. The camp is completely off the grid, depending solely on PV (photovoltaic) panels to operate the lights and recharge batteries for guests. PV panels also power the pump that carries water from the well or "borehole" to the kitchen and bathrooms. We learned about Tshulu Camp, as well as our village homestay I wrote about earlier, through friends with the Organization for Tropical Studies, an educational consortium that offers ecology courses in Costa Rica and South Africa. The OTS friends directed us to Tshulu Trust Administrator Thuseni Sigwadi, an energetic and very friendly young man. Thuseni Sigwadi, an administrator of the Tshulu Trust and its Tshulu Camp. His job includes arranging camp stays, as well as homestays in the adjacent village of Hamakuya. His contact info is below. Thuseni arranged everything for us, gave us driving directions, and for the homestay, he met us at the turn off into the village. Later, he rode with us from the homestay to Tshulu Camp, to help us steer our tiny VW around the most difficult rocks. As much fun as the homestay was, Tshulu Camp was just as valuable in its own way. 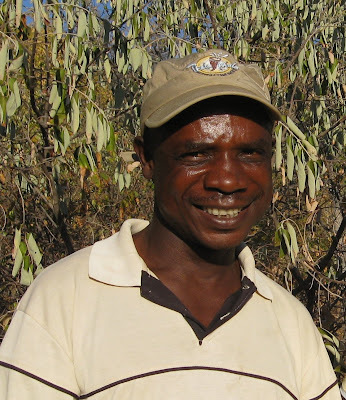 Thuseni suggested the camp for the birding opportunities and the quiet natural setting on the Mutale River. He said Fhatuwani Makuya could serve as our nature guide while we were there. 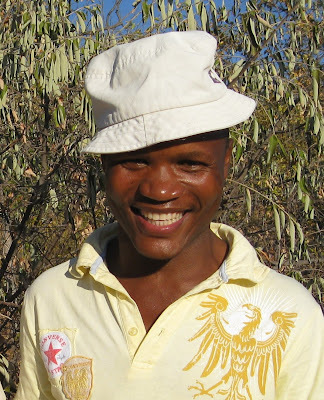 Fhatuwani Makuya, who served as our translator during our homestay, is also a nature & birding guide at Tshulu Camp. He's in training to be a game guard for national parks, a dangerous but fascinating job. Game guards protect wildlife from poachers. More about what we learned about poaching in a later post. You can see our previous post on rhino poaching here. Tshulu Camp was beautiful, comfortable, quiet, and the perfect place to relax in privacy after the homestay. It has 5 guest tents, and a lovely outdoor covered dining area. The staff was so, so friendly. The dining room, above. We loved the "catering lady" Rosina Netshituni (in red). She fixed all our multi-course meals, which were more than scrumptious. She was happy to talk recipes with anyone who could speak a little Venda. We tried! Much of the food prepared in the camp's kitchen comes from their organic vegetable garden. The garden not only supplies food for the camp kitchen, but also provides employment for villagers living nearby. The vegetable garden is irrigated from underground, which is a plus, as water shortage is a big issue in Africa. The camp uses their waste sustainably too - composting all the vegetable and garden waste to enrich the soil for the organic farm. So those tasty vegetables prepared by Rosina are organically grown on fertile, composted soil! A dedicated birder, Ken spent most of his free time wandering around through the bush along the riverbank looking for birds, while I was socializing. We did see quite a few birds in the area of Tshulu Camp and Hamakuya, including the Namaqua Dove, Cut-throat Finch, Red-billed Quelea, Great Rufous Sparrow, White-throated Robin Chat, and Levaillant's Cisticola. One thing I really appreciate is how the camp has retained the natural topography of the land and all its native plants. The spacious and luxurious tents where guests stay required no grading at all. When construction projects do grade land to make it level for roads or buildings or landscaping, the grading destroys topsoil, native plants, animal homes, and wreaks havoc with natural communities. Tshulu Camp has avoided that, which is one reason the bird life there is prolific. There's also no pavement in the village or at Tshulu Camp. All walkways and roads are natural substrates, allowing natural water cycles to continue unaltered. Rainfall percolates through the ground everywhere, to recharge ground water, streams, and rivers. The deck of our tent, immersed in native flora, overlooked the Mutale River (photos above and below). We enjoyed hangin' out on the cool tent deck in the evenings, when not hiking, eating or schmoozing with fellow campers. What a view! The inside of our private tent. Our private bathroom with shower, inside our tent. These PV or photovoltaic panels (below) power Tshulu Camp's lights and charged our camera batteries. The PV panels below power the pump for the "bore-hole" (or well) that provides water for the camp. Baobab trees were common in and around Tshulu Camp (below). Student Erin Wilkus (below) from Reed College in the U.S was studying the baobabs at Tshulu Camp, for an academic project, while we were there. Erin had already made friends with the children of Hamakuya and, on a short trip into the village, she stopped to play clapping games with them. Ben Zarov (in gray sweatshirt below) from Grinnell College was working at Tshulu Camp temporarily as a volunteer, doing odd jobs and helping maintain the grounds. The children loved Erin and Ben, who had both been at Tshulu Camp for a while and had learned a lot of the Venda language. 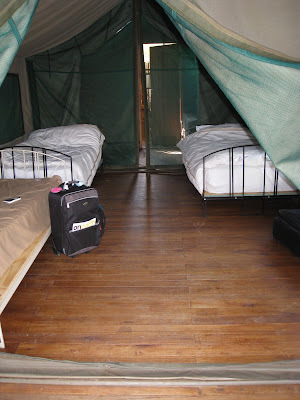 I highly recommend a stay at Tshulu Camp and a homestay at Hamakuya. If you want to go, e-mail Thuseni Sigwadi, Tshulu Trust Administrator, at tshulu@gmail.com. You can call Thuseni at 011 27 72 997 6669 (from the U.S.). He speaks excellent English. From South Africa, his number is 072 997 6669. He can arrange the whole thing for you. When you choose to visit locally owned and operated nature resorts, and particularly homestays, you learn so much more about the people and their way of life than you would in a hotel chain, or a foreign operated resort. Plus, your dollars help to empower these communities to conserve their trees, their wildlife, their wild landscapes. Dollars from ecotourism replace dollars from logging or from sale of wildlife and wildlife parts. When you support locally owned "green" tourism, you're protecting irreplaceable natural resources for future generations. The Tshulu Trust is working on a website that will be online shortly. I'll post a link here or in a later post when the site is up.